Just Flight is holding a screenshot competition to win the Aeroplane Heaven Douglas DC-6 - Legends of Flight for FSX. Virtavia has added more preview screenshots from the upcoming General Dynamics F-111 Aardvark for FSX. Vidan Design has posted more preview screenshots from Danish Airfields X - Sæby Ottestrup Airport (EKSA) for FSX. Paulo Ricardo has posted preview screenshots from the upcoming Rio de Janeiro 2012 photo scenery for FSX. The recently released FranceVFR Haute Normandie VFR photo scenery for FSX is now also available at SimMarket. - Mesh (relief) specific high definition real 4.75 meters (LOD13). - Airports and aerodromes including semi-detailed correct the influence of "platform". - Integration of 3D modeling for Automation ® multi-million buildings and vegetation zones realistic and appropriate to the region. - Extremely dense vegetation cover and optimized using a realistic rendering module controlled by artificial intelligence (AI). - Autogen buildings including additional 3D specific and optimized variants. - Development process 100% compliant with SDK specifications, ensuring maximum compatibility with the arrival of new versions. FSAddon has posted this preview video of the upcoming Real Earth Dolomiti X - Zoldo and Pelmo 3D scenery for FSX. Ben Supnik has posted an article concerning improvements in X-Plane 10 city autogen on the X-Plane Developer Blog. FSWidgets has released the Electronic Flight Bag for iPad. More information and purchase at the Product Page. - Display approach plates or charts. - Display online WX (Weather) Images (e.g. doppler radar, cloud cover, satellite, etc.). - Moving Map connects to FSX, FS2004 & X-Plane 9/10. - Flight Plan Display - supports native FSX, FS2004 and X-Plane flight plan files. - Waypoints can be tapped to reveal the related data (e.g. lat, lon, ident). - Map powered by CloudMade map rendering API (using OpenStreetMap data). FS2Crew has released the PMDG Boeing 737NGX Edition for FSX. Now available at the FS2Crew Online Store. The recently released Carenado Beechcraft V35 Bonanza for X-Plane is now also available at SimMarket and X-Plane.org. - Many details as: pitot, antennas, chocks, pitot cover, baggage area. FSFLIGHTproductions has posted this video from the Outerra Terrain Engine which is currently under development. Turbine Sound Studios (TSS) posted this internal preview video from the upcoming Embraer E-190 HD Sound Package. Daniel Furnkas has posted more preview screenshots from the upcoming freeware Basler BT-67 for FSX. Coolsky has posted this preview of the interactive system schematics on the upcoming Douglas DC-9 for FSX. Carenado has posted several night panel preview screenshots from the upcoming Beechcraft King Air C90 for FSX. Flight1 has released SoundStream for FSX. More information and purchase at the Flight1 Product Page. - Keeps the Flight Simulator sound flowing even when other applications are in foreground. - Can be switched on/off at any time inside Flight Simulator. - Optionally can reduce the sound volume when switching away from FS. - Supports FSX and Prepar3D. Aerosoft is offering 20% discounts on select sceneries during the City Deals Sale. Valid through March 12th 2012. A-Flight has posted more development previews from the upcoming Helsinki-Vantaa Airport (EFHK) for FSX. Navigraph NAVData AIRAC Cycle 1203 is now available. Purchase Credit Packs at Navigraph or SimMarket. Orbx has posted the first preview screenshots from the upcoming Firstair Field Airport (W16) scenery for FSX. The Frat Bros Design - PAC CT/4 Airtrainer is now also available for FSX. Details at FS Pilot Shop or SimMarket. Majestic Software has posted another video demonstrating the flight dynamics on the upcoming Dash 8 Q400 for FSX. Aerosoft has posted more preview pictures from the upcoming Amsterdam Airport Schiphol (EHAM) for X-Plane 10. The freeware FISD Seinäjoki Airport (EFSI) has been converted for use with X-Plane 10. Download at X-Plane.org. The freeware El Alto International Airport (SLLP) for X-Plane is now available to download at the XPFR Website. ST Design has released the freeware Borgond VFR Scenery (LHBD) V2.0 for FS2004. Download at Flightsim.com. 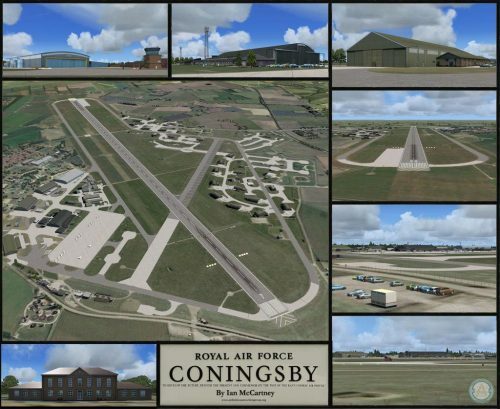 The freeware Coningsby Air Base (EGXC) for FSX by Ian McCartney is now available to download at AVSIMrus. The soon to be released RotorWay International Exec 162F for X-Plane can now be previewed in this video. MilViz has announced development and posted several preview screenshots of the Boeing 737-200 for FSX. OrientalSim has released Nairobi Jomo Kenyatta International Airport (HKJK) for FS2004. Available at SimMarket. - Buildings designed according to photos and placed as the real one. Taburet has released Prague Photorealistic for X-Plane 10. Now available to purchase at SimMarket. The Dino Cattaneo Lockheed Martin F-35 Lightning II V2.0 project for FSX is now accepting beta testing applications. The free Global Aviation Magazine Issue 6 - March 2012 is now available to view and download at the GAM Website. The FlightSim Development Group has posted the first screenshots from Keflavík International Airport (BIKF) for X-Plane 10. DBS Studio has release update version 1.1.0 to Terrain Map for FSX. Details and download at the Product Page. - Preview on the 737 Captain Base pack. - 737-100 exterior model free demo is out. - 737-200ADV expansion model confirmed. - The Base pack will feature the -200 instead of the -100 model. - The Base pack release price announced.